This year the children of St Mark's delivered an important message - God is a faithful gardener. This was such a special service as it provided a time for us to worship together as well as share in the wonder of Harvest and helping others. Every child played an important role of getting across a clear message - Harvest Thanksgiving is an opportunity to thank God for the crops and the fruit of the ground, upon which, despite all our clever technological advances, we are still dependent. It's a big thank-you for the food we can eat and for its variety. All given to us by God, who is a faithful gardener. 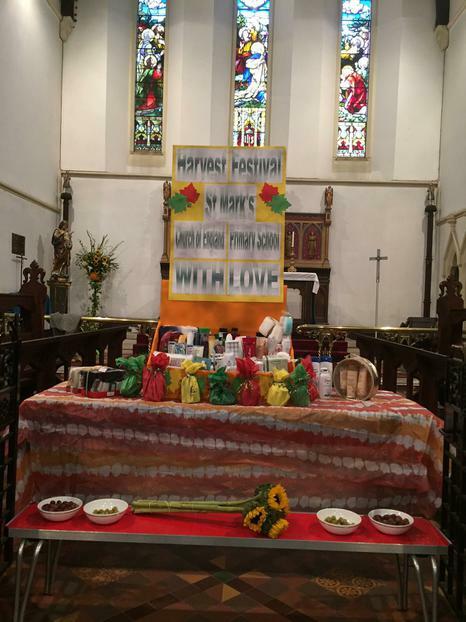 The children in Year 1/2 told a heart-warming story about how God will provide us with enough to say thank you assisted by Year R.
Year 3/4 explained to the congregation why the truth is that as far as Christians are concerned, all foods are GM products! God Made! Year 5/6 led the congregation through a thoughtful 'seed confession' making the act of confession during the service interactive and with a link to the theme of seedtime and harvest. will supply and multiply your sowing and increase the harvest of your kind deeds. We had so any wonderful comments from families who attended, and some were even moved to tears to through out powerful message. Thank you for worshiping with us. A Note of Thanks, to say that we raised £110.21 (+$5USA) at the School Harvest Festival yesterday ... so, along with the generous 'toiletry' gifts for our Housebound Church, may we say a BIG "thankyou" to everyone from both them and the British Red Cross. Much appreciated.